I never saw this coming but that doesn’t make it any less awesome. Doncaster (UK) based company Blaze have created a handheld Megadrive which comes with 20 classic games built in for your playing pleasure. It even plugs into your TV apparently. Sporting a classic Megadrive D-Pad and A,B,C button layout it’s hard for a long time Sega fan such as myself not to fall in love with this thing, even if claims by Blaze that this is the first handheld Megadrive are completely unfounded. Anyone remember the Sega Nomad? You can buy it from http://www.segaretro.net/ for the price of £29.99 or $59.25 for our American friends. 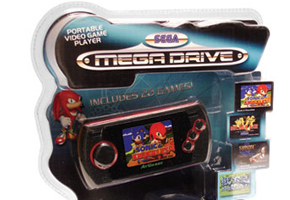 You guys will just have to put up with it being called Megadrive instead of Genesis.